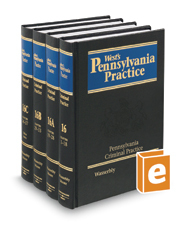 For more than two decades, the authors of Pennsylvania Criminal Practice have provided quick answers to novel and recurring questions in criminal practice. This edition offers starting and ending points for detailed research, as it is supplemented with current caselaw, new and amended statutes, and rule changes. It provides a chronological discussion of all stages of a criminal prosecution from pretrial identification through trial and appeal. Also find valuable practice tips and commentary from both the prosecution and defense sides, extensive cross-references, more than 100 forms, checklists, and model cross-examination questions and answers.